Upon his capture near Ramsey, Huntingdonshire on 1 February, 1941, Josef Jakobs was found with several smoking accessories in his possession. One of the Home Guard volunteers who found Jakobs said that he was surrounded by used cigarette butts (about 30) and that his lighter was empty. During his imprisonment at Camp 020, the British interrogation centre, Jakobs requested an increase in his cigarette ration as 10 cigarettes a day was not enough for him. Clearly he was a heavy smoker. Jakobs was carrying a packet of Cordon Rouge cigarettes. The packet contained 20 cigarettes and was marked American Blend (No. 3525). Cordon Rouge simply means Red Ribbon and is most commonly associated with Cordon Rouge champagne and Cordon Rouge Grand Marnier. There was cigarette manufacturer in Germany who manufactured a Cordon Rouge brand of cigarettes, A. Batschari. The company was based in Baden-Baden and operated from 1834 until World War 2. There are very few pictures of Batschari cigarette cases and it is conceivable that they also made an American Blend version. cigarette case advertised on Ebay. Jakobs was also carrying a leather cigarette case marked ZEKA WETTIG GEDER. Several years ago, a reddish leather cigarette case, from ZEKA, was listed for sale on Ebay in Singapore. Another leather case, slightly different in style from the first one was recently listed on the UK Ebay site. Cigarette cases were quite popular with soldiers during the war. The wear and tear on cigarettes in paper packets could be quite heavy and so many soldiers carried their cigarettes in leather or metal cigarette holders which offered more protection. Jakobs' leather cigarette holder is lost to history. He may have given it away to one of the witnesses at his trial (perhaps one of the farmers or Home Guard soldiers) or passed it along to one of his Military Police guards. 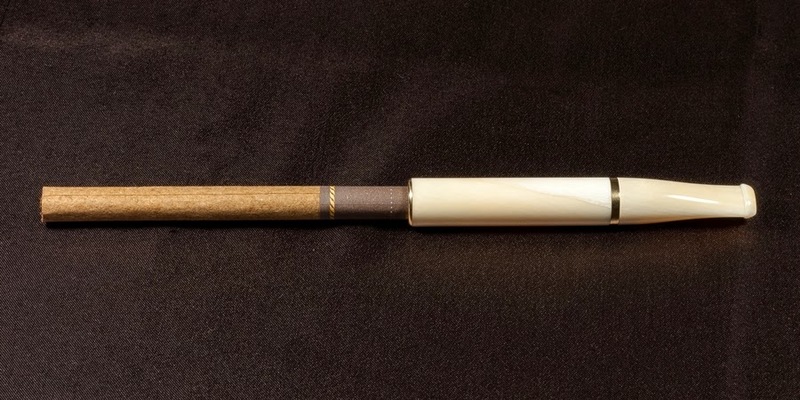 An example of a shorter cigarette holder. Cigarette holders were also practically useful. In the days before cigarettes contained built-in filters (pre-1960s), the cigarette holder contained a filter. Plus, a cigarette holder would prevent nicotine staining on the fingers. There was no description of Josef’s cigarette holder or of its length or composition. It too was lost to history. 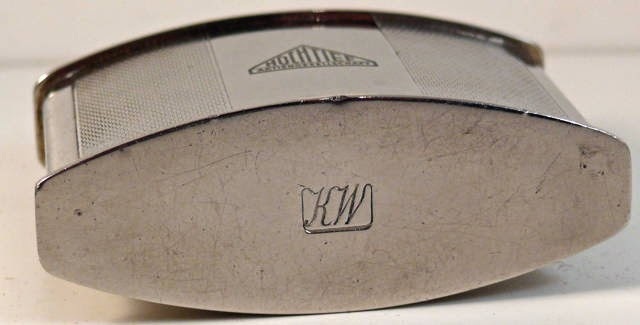 initials KW on the base. Jakobs also had an automatic lighter in his possession which was marked KW on the bottom. After much speculation as to the meaning of those initials, the MI5 officers eventually concluded that the letters were simply a trademark of the manufacturer, Karl Wieden. Karl Wieden was a German company based in Solingen that manufactured lighters from 1905 to 1980. The trademark initials of the company were KW, later becoming KAWEE. Those initials were often inscribed on the bottom of Karl Wieden lighters. Jakobs may have given his lighter to one of the witnesses at his court martial or to one of the military police guards. It too was lost to history. National Archives, Security Service Files - Josef Jakobs - KV 2/24, KV 2/25.